European immigrants brought many Christmas traditions to America between the 17th and 19th centuries. Pennsylvania, with its mix of Swedish, Dutch, Quaker, German, French, Welsh, Scots-Irish and other settlers, had a rich assortment of Christmas customs to draw upon. 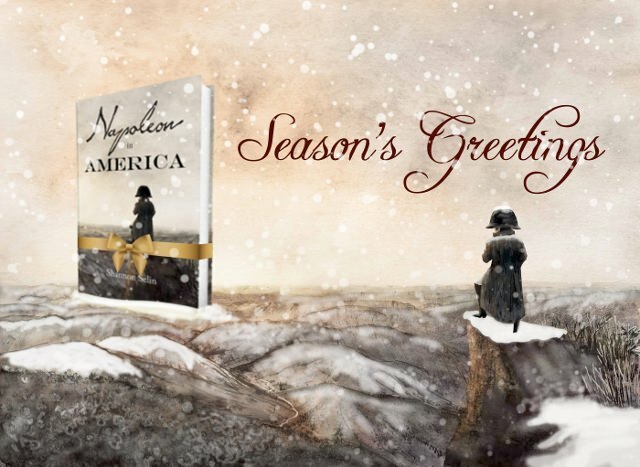 Joseph Bonaparte and the other Napoleonic exiles who settled in the Philadelphia area after 1815 probably encountered some of the Christmas Eve traditions described in the following article, which appeared in a Philadelphia newspaper in 1827. “We like a holiday, and so does every care-worn, labour-stricken animal in the community, and the preparation, preliminaries, and anticipations of a pleasure are frequently quite as agreeable as the reality. Of all the religious festivities, none are so religiously observed and kept in the interior of our state, especially in the German districts, as Christmas. It is the Thanksgiving day of New England. Every one that can so time it, ‘kills’ before the holidays, and a general sweep is made among pigs and poultry, cakes and mince pies. Christmas Eve too, is an important era, especially to the young urchins, and has its appropriate ceremonies, of which hanging up the stockings is not the least momentous. ‘Bellschniggle,’ ‘Christkindle’ or ‘St. Nicholas,’ punctually perform their rounds, and bestow rewards and punishments as occasion may require. “Our readers are perhaps aware this Mr. Bellschniggle is a visible personage – ebony in appearance, but topaz in spirit. He is the precursor of the jolly old elf ‘Christkindle’ or ‘St. Nicholas,’ and makes his personal appearance, dressed in skins or old clothes, his face black, a bell, a whip, and a pocket full of cakes or nuts; and either the cakes or the whip are bestowed upon those around, as may seem meet to his sable majesty. It is no sooner dark than the Bellschniggle’s bell is heard flitting from house to house, accompanied by the screams and laughter of those to whom he is paying his respects. With the history of this deity we are not acquainted, but his ceremonious visit is punctually performed in all the German towns every Christmas Eve. Christkindle, or St. Nicholas, is never seen. He slips down the chimney, at the fairy hour of midnight, and deposits his presents quietly in the prepared stocking. “We need not remark that Bellschniggle is nothing more than an individual dressed for the occasion. He goes his rounds. 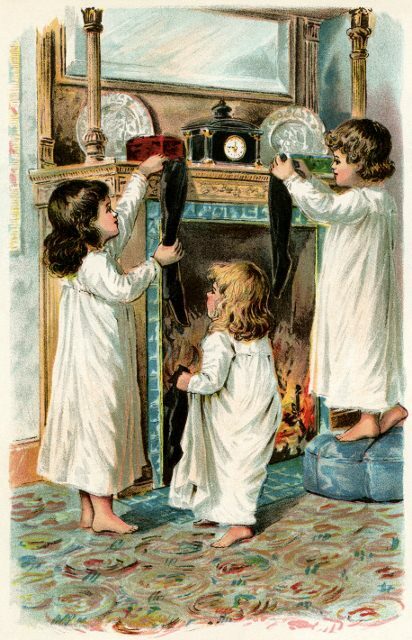 The younger part of the community each hang up a stocking in the chimney corner, and shortly after old and young are quietly dreaming of the joys of Christmas. This is Christmas Eve in the country. “In the city, the scene is somewhat different: the ceremonies run more upon trinkets and presents. Confectionery, fancy, and toy-shops are illuminated and decorated. Pies and pastry, sugar-plums and candy, trinkets and toys, are lighted up and displayed in tempting array. Gloves, ribbons, work-cases, hats, shawls, and ‘forget me nots,’ plums, nuts, and trinkets are staple commodities for the night. In one place you see a pretty damsel dressed and ornamented queen, in a palace of ice-creams, frosted cakes, jellies, sweetmeats, and cordials. In another, the handmaid of the graces in the midst of bracelets, bandeaus, wreaths, and flowers, herself the fairest, and perchance not the least artificial flower. And there a toy-shop, the world in miniature, kings, beggars, soldiers, priests, dogs, cats, elephants, and sheep, wolves and parrots, bears and fiddles, camels and musical glasses, pigs and fine ladies, and the pigmy representatives of every animate and inanimate thing under the sun, congregated together in glorious confusion; which, with a throng of animated bipeds – maids, mothers, and children – and a perpetual volley of cross-questions, half French, half English; inquiring prices, ‘beating down,’ making bargains, form a rich medley of ‘sights and sounds’ on a Christmas eve in the city. During the night the streets are alive with people passing to and fro, joyful and merry. Saturday Pennsylvania Gazette (Philadelphia), December 29, 1827. We like a holiday, and so does every care-worn, labour-stricken animal in the community, and the preparation, preliminaries, and anticipations of a pleasure are frequently quite as agreeable as the reality.